Is the brand still for the uptown girls? 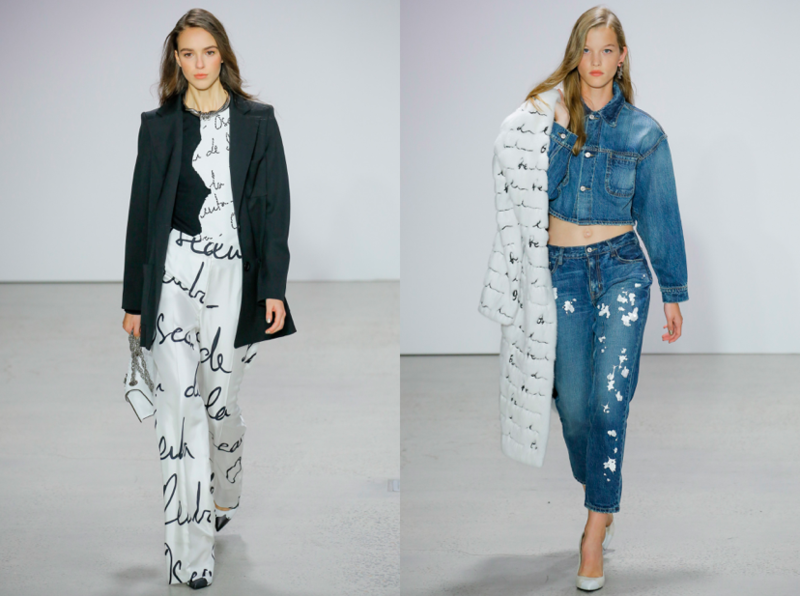 In their second runway show for Oscar de la Renta, dynamic design duo Fernando Garcia and Laura Kim rewrote the script for the classic American house–literally–taking inspiration from that unforgettable red carpet moment when Sarah Jessica Parker wore an autographed Oscar gown to the Met Gala in 2014. There wasn’t a hint of tweed, royal jeweled embellishment or ladies-who-lunch suits at their show held late Monday afternoon at Sotheby’s on the Upper East Side. 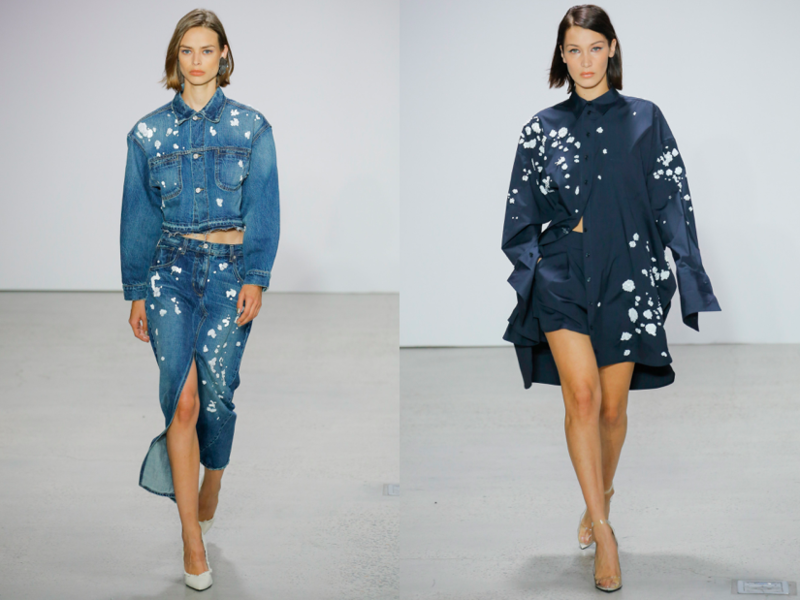 In their place: denim – white and indigo – embellished with kooky embroidery; modern cropped and colorful palazzo trousers, and easy jackets; logos everywhere, these replicas of Oscar de la Renta’s actual signature – carved into slim furs, scribbled on dresses and sweaters, and even worked into a twisted metal belt that spelled it out and wrapped around a model’s, ever so thin waist. There were paint-splattered pieces – a slim white gown with a black shoulder strap looked like it had a run-in with a Benjamin Moore store but, yet very distinctive. Dress and gown silos overall were mostly closer to the body, many boasting wild abstract collages comprised of material strips and massive patches of sequins even with some in heart-shapes.There were glitzy, all over sequin slithers for party girls, a frilly black tulle number was dappled with gold paint, and boring, but true, here was the perfect black cocktail dress with asymmetrical straps. 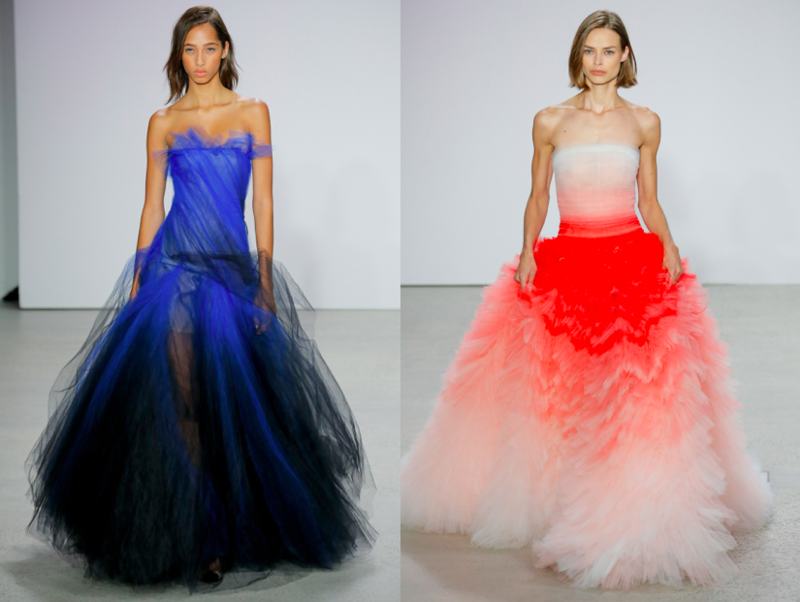 Alas, what’s an Oscar de la Renta fashion show without a blown out ballgowns? The brands runway closed with a series of them, all mountainous tulle numbers, dip-dyed, ombre – in pacific blue and blushing pink – one even worn with a ruby dip-dyed mink coat. This entry was posted in New York, Trend Reports and tagged New York Fashion Week, nyfw, oscar de la renta, Spring 2018. Bookmark the permalink.